Second Row: Joseph Henke, Mia Smith, Noah Marshall, Grace Goodwin, Hannah McDonald. 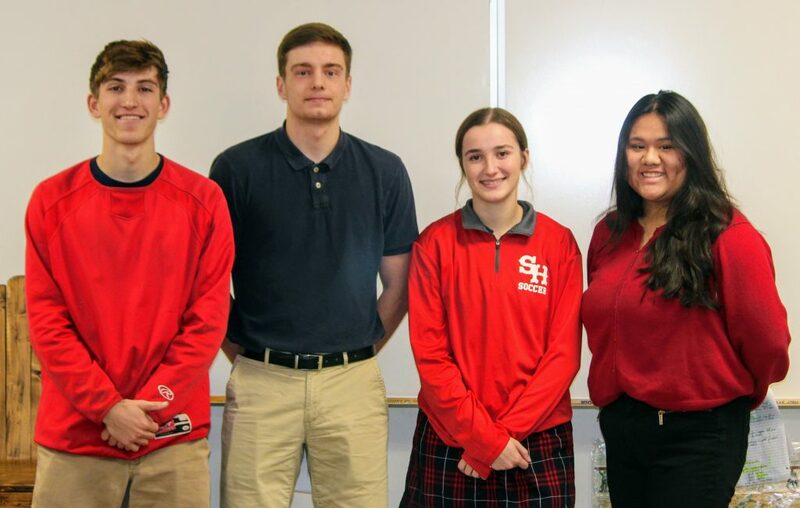 The National Honor Society (NHS) at Sacred Heart High School is comprised of students who are determined to be their best selves during his/her high school career. To be a NHS member, a student needs to have a cumulative GPA of 3.5 and a minimum of 20 documented service hours. NHS has monthly meetings throughout the year to find new and innovative ways to serve the community and the student body. “NHS is the cream of the crop out of an already great group of kids,” says Mrs. Timara Kennon, NHS Advisor. 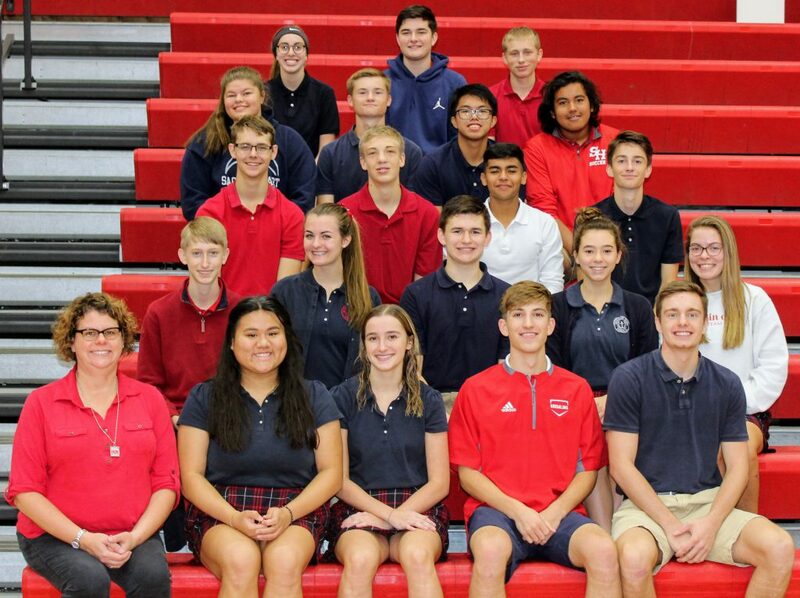 The Sacred Heart Chapter of the National Honor Society serves to create enthusiasm for scholarship, to stimulate a desire to render service, to promote leadership, and to develop character in the students of Sacred Heart High School. The Sacred Heart NHS coordinates several service projects throughout the year. A few of these projects include the annual Christmas Eve dinner for the elderly and disabled, adopt-a-highway, and service at the Community Café. “NHS is an extravagant experience and everyone strives to be a member of this team,” remarked Chase Marshall, Senior and NHS Member. One of NHS’s greatest traditions is, the annual Christmas Eve Dinner is a tradition which has been at Sacred Heart for over 40 years. This dinner provides meals on Christmas Eve for the underemployed, unemployed, and residents of Pettis County who have fallen on hard times. In 2018, the Sacred Heart NHS served over 700 meals to people in the Sedalia community. Monetary donations are accepted year-round to help with expenses related to the Christmas Eve Dinner. Money may be sent to the school office with a note indicating the purpose of the donations. Scholarship: Students who have a cumulative GPA of 3.5 meet the scholarship requirement for membership. Service: Students must have a minimum of 20 documented service hours prior to the completion of the NHS candidate form. This service MUST be done without compensation. Character: The student with good character upholds moral and ethical principles, is respectful of others, and demonstrates honesty, concern, and respect for others. The candidate should also demonstrate tolerance towards others, courtesy, and cooperation. Other criteria based on the SH handbook, fines, or violations will be reviewed. The induction for the upcoming members will take place in the winter of 2018. When deciding on potential new members, students and teachers submit forms that focus on the desired behavior of an NHS member. The student must be an example of stewardship and exhibit devotion to being the best.